LMG recently added a supply of Ayrton MAGICPANEL 602 fixtures to the firm’s lighting inventory. 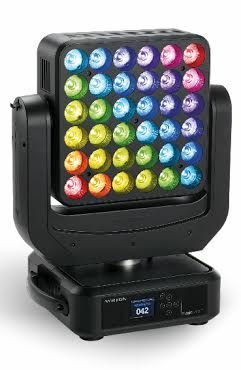 LMG Ayrton MAGICPANEL 602 The MAGICPANEL 602 is a modular LED luminaire that offers visual effects on a moving head LED beam projector, equipped with 36 15W LED RGBW emitters in a 6x6 array. Each emitter projects a 7.5° 45MM optic beam and can be controlled individually or used in groups to emit an overall 14,000 lumen channel of light. Its ability to run on continuous double rotation on both pan and tilt axes adds dimensional effects to beams individually projected by mapped emitters. The MAGICPANEL 602 displays and effects allow designers the option to display numbers, letters, graphic effects or images, all while providing energy efficiency and fast action display.